« April Paleo Contest Starts Tomorrow! Tracy practices her weaknesses and is always improving. She may be on to something. It’s the 1st of the month, it’s GOAL Setting Time! Start the month of right. Set them NOW! 2 to 3 exercises/movements you are set on improving on. Build them into the regular warmup and your cool down. Practice them constantly. -April 1st (today) to April 30th: Paleo Contest. 1st Class starts this Saturday. Email us with your questions. Post your goals…let us have it! 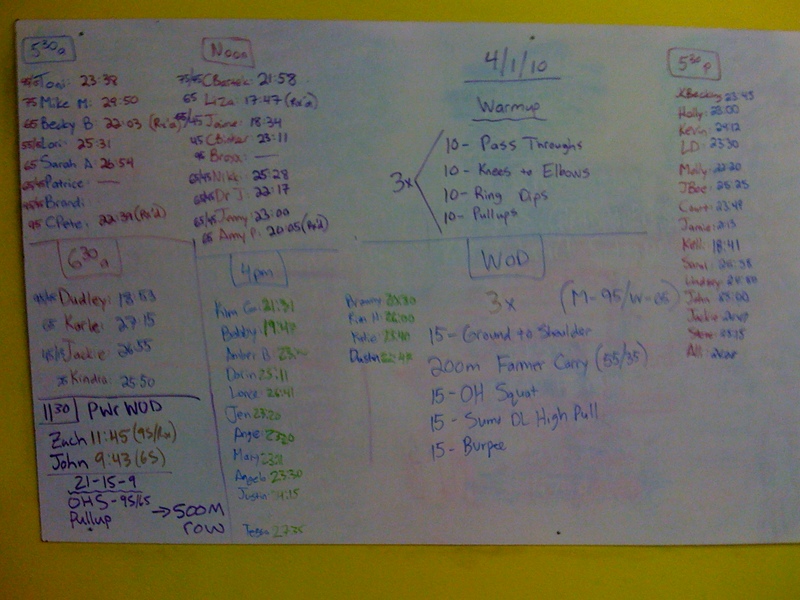 This entry was posted on April 1, 2010 at 10:13 pm and is filed under Crossfit Philosophy, CrossFit Workouts, Members. You can follow any responses to this entry through the RSS 2.0 feed. You can leave a response, or trackback from your own site. 3. Faster and better at all exercises (Pushing through and less breaks). 1. Handstand push-ups – I’m getting better, but still need to get rid of those mats. 2. Running – I want to be able to run 1 mile without wanting wanting to pass out since I forget to breathe. 3. Grilling – This is not so much gym related, but I need to learn how to use my grill so I can grill some new paleo food. That thing is just so scary to me!! 2) KBS form-I tend to lose form when I try to go faster. Gonna go to the market and find me a KB! 3) Try to attend Oly classes more frequently to work on form/strength more. 4) Dance and sing like there is no tomorrow! Paleo is beautiful like a pearl. *NOTE: This post was written under the influence of lack of sleep. All comments are original and may not be published without the written consent of the author. If not taken as directed, it may cause drowsiness, mental instability, and hurl-ified foods (sooooo wanted to put the “seepage” part you commonly hear but I don’t want you guys to think I’m insane 🙂 ). Please follow as directed. 3. Continue to get stronger, and always focus on keeping the crossfit games standards even if it means sacrificing my time! Keep focusing on eating healthy and Paleo always be prepared with snacks and good healthy treats!! 3) no complaining about OH squats or burpees or box jumps or anything that I may not enjoy doing during the WOD. POSITIVE every time! 4) If physically possible, prescribed every WOD. and 5) push ups chest to floor! Keep me on track CF friends!!!! 3. Like Jenny, running on my days off of CF. My dogs will love that goal! They love their exercise too. Thanks Chris for the help on the deadlift form today. No aching back tonight!